I've desperately needed some pretty flowers and plants in my front yard for quite some time so I was happy when my friend Susan recommended Terrestrial Landscape and Design to do the job. They're based in the Grant Park section of Atlanta and made up of husband and wife team, Adam and Kara Ziegler. 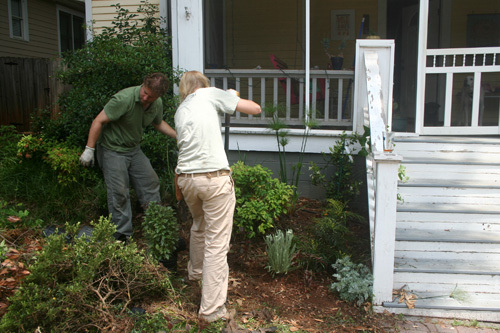 I had two requests for them- use as many native plants as possible and incorporate plants that work well for clippings. Inspired by Wendy Binns, who has an incredible yard full of textured plants and gorgeous greenery, I wanted leaves and flowers I could easily cut and add to vases year round. I'm excited about this vine, called moonvine or moonflower. It's a night blooming morning glory which you'll find quite a bit in Florida and south Georgia. If offers up large, fragrant white or pink flowers but only in spurts. As stated on Wikipedia, "The flowers open quickly in the evening and last through the night, remaining open until touched by the morning sun." Adam described my new front garden as Southern subtropical. He then quickly ammended it to old fashioned subtropical. I like both descriptions. The great part is I can slowly add more plants to the garden as I decide on what works best. For now, thanks to Adam and Kara, I finally have some luscious greens and fragrant blooms to grow and change with the seasons. This is Artemisia powis castle which grows best in full sun. Its silvery green leaves look quite lovely in small vases, no matter which time of year. The plant rarely flowers and is an evergreen here in the South. Some of Adam and Kara's recommendations for native plants to buy and plant now, in anticipation for the fall, include local Asters, Swamp Sunflowers, and Arkansas Blue Star. Each offer their own brilliant colors, unique textures and foliage. 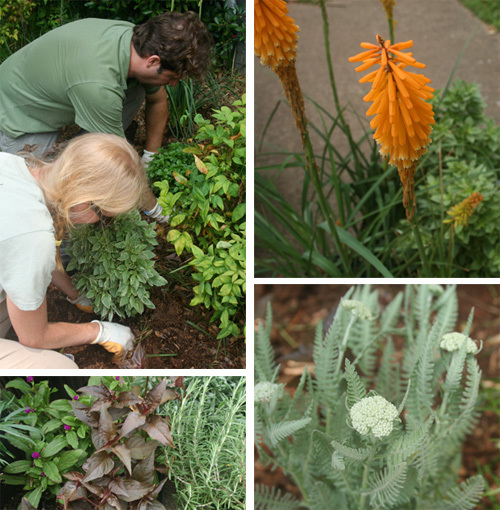 Thanks for all your hard work and lovely plantings Adam and Kara ... To learn more about their incredible work at Terrestrial, click here.